So, for the past three years, I've attended a blogging conference in the fall. (btw, I've just passed my 4th writing a blog anniversary also...) But, this year I'm choosing not to. For a variety of reasons. The price of the conference got raised, the speakers/topics were not piquing my interest, and the originally advertised perks were less essentially less bang for your buck. Add hotel and airfare to the conference ticket, and we were looking at an experience of over one thousand dollars. Which was just not speaking to me. Plus, Amanda, my conference roomie, was not thrilled about the line-up/cost either, and wasn't planning to go. Being the loyal introvert that I am, I decided to take the year off from the conference. And go to the Lone Star State instead. To hang with my sisters. And my parents. And maybe a brother or 2. And, such a deal! (say that in your best Jewish mama accent.) I'm actually saving money by going to Texas. At least compared to the conference. Which is how I presented it to Mr. Hippie. A 50% savings! Who's going to argue with that? I left home early Thursday morning, and I will wing my way back into town after noon on Sunday. And no 18 hour car ride. But...lots of reading (on the planes). Lots of laughter. Some painting. Maybe a pedicure. Good food. Coffee. The Texas State Fair. What's not going to be fun about that? Let me tell you though, it is a push to get out the door. Meals to plan and cook. Groceries to buy. Babysitters to line up. School work to assign. House to clean. Yes. I took 1 piece of luggage. A carry-on. My back pack. And this is not the backpack I took to Spain, either. This is my swimming, triathlon gear backpack. (which will hold a towel, wetsuit, goggles, running shoes, biking shoes, hat, sunglasses, socks, and timing chips-and still zip up. It's plenty big for the weekend. Especially since I am not running while on vacation. So, I only am bringing/wearing one pair of shoes. And I can borrow my sister's hairdryer. 2 books. 2 outfits. Pajamas. iPad. Chargers. Unmentionables. Toiletries. Anyway, I can't let this Friday go by without sharing an easy-peasy recipe with you. 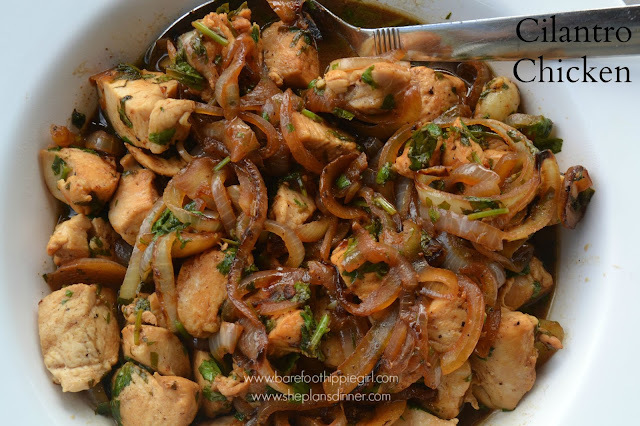 Chicken, cilantro, onions, lemon juice. I've no idea what it's ethnic roots are, but I can assure you that it was delicious. And very quick to prepare. 30 minutes tops. Including the rice. All the ingredients are ones that most of us have on hand, so make enjoy this recipe this weekend! 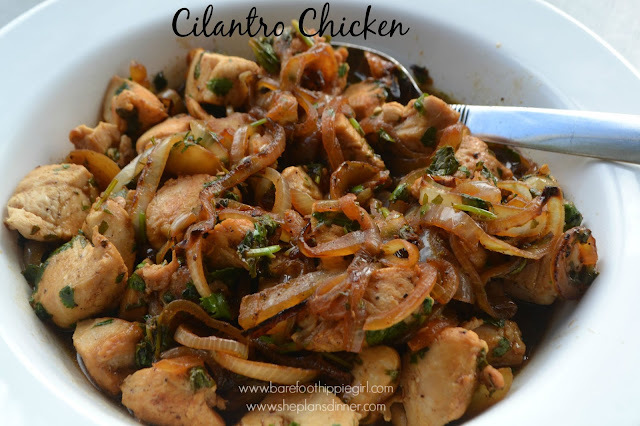 -Cut each chicken breasts into 2-3 strips each. Sprinkle with salt, pepper, and cumin. -In a large skillet, over medium heat, cook chicken until browned, about 4 minutes per side. Remove and keep warm. -Peel and thinly slice onions. -In the same skillet, melt the butter. Sauté the onions until tender and golden brown. Mince the cilantro. Return the chicken to the pan. Stir in the lemon juice and the cilantro. Bring to a boil, and cook 1 minute. -Serve over cooked rice if desired.